The cumulative foreign currency earnings by the sector, since 1978, when the first export was registered, is estimated at 36.6 billion dollars. Now, Bangladesh eyes $50-billion apparel exports by 2021, when the country will celebrate the 50th anniversary of its independence. Only after China, Bangladesh has emerged as the second largest apparel exporter with a whooping $25 billion export industry increasingly growing. Thus, McKinsey & Company, a global management consultancy firm, predicted that Bangladesh will be able to export $44.56 billion worth of garment products by the end of 2020. Some of the high-end fashion brands such as Hugo Boss, Puma, Tommy Hilfiger, G-Star, Diesel, Ralph Lauren, Calvin Klein, DKNY, Nike, Benetton and Mango have been outsourcing garment products from Bangladesh over the last few years. Over the last five years, the RMG sector secured a remarkable growth with the market has been expanded by four fold, more than two fold rise in employment, it’s contribution to country’s economy was soared by 3% while a steady rise led the sector to account for the lions share in the country’s export earnings. 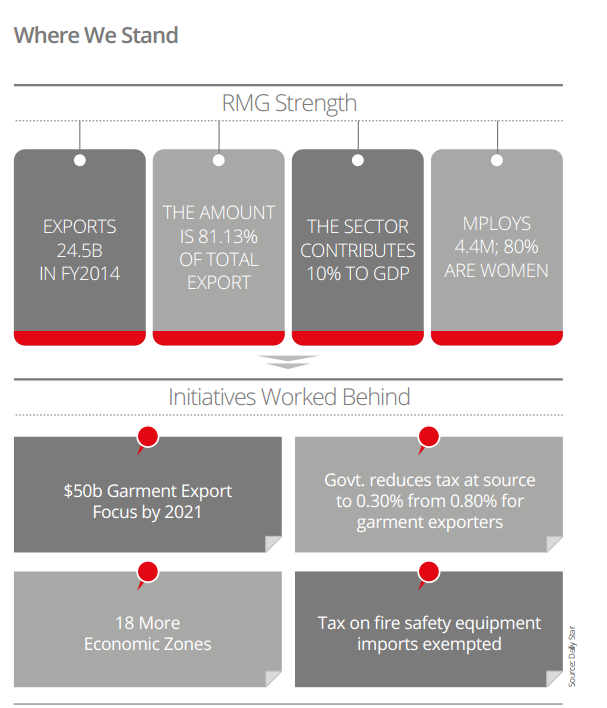 Two hundred more factories have emerged, creating further employments and expanding the horizon of apparel shipment. Such an unprecedented level of transformation that took place in last decade has also helped Bangladesh in shaping the economy and slashing the poverty down too. Lets take some of the growth indicators to portray the major transformation occurred in last decade. Exporters for the first time hosted a three day apparel summit in December with twin objectives — to hit $50 billion garment exports by 2021, and to repair the sector’s image that was dented by industrial disasters. A total of 21 retailers from the US and 44 from the European Union have registered for the Dhaka Apparel summit, which will also have an exhibition of fire safety equipment spread across 92 stalls. Inaugurating the summit, Prime Minister Sheikh Hasina came up with some time bound pledges targeting to help the industry in taking its next giant leap. Besides increasing electricity production, the government is working to build as many as 18 economic zones and a “garment village” in Munshiganj, she said. Apart, the Awami League led government has announced to bring down tax at source to 0.30%. On last December 8, Prime Minister Sheikh Hasina officially opened the Centre of Excellence for the Bangladesh Apparel Industries (CEBAI), an initiative to create a skilled labour force for the export-oriented industry. Based in Ashulia, the centre will help meet the sector’s need for skilled labour by providing competency-based training in areas where demand from the industry is the greatest. By training workers to nationally recognised standards, it will also help them gain skills to earn higher wages. The centre was supported by the International Labour Organisation (ILO), Government of Sweden, leading Swedish fashion retailer Hennes and Mauritz (H&M) and Bangladesh Garment Manufacturers and Exporters Association (BGMEA). In a bid to offset any significant drop in garment export figures, the government in 2009 introduced a financial package to encourage garment manufacturers to explore new destinations. Under the scheme, the government gave 5 percent cash incentive to garment exporters in fiscal 2009-10, 4 percent in fiscal 2010-11 and 2 percent in fiscal 2011-12. The exporters received 2 percent cash incentive for exporting to the new destinations in 2013. This year they continued to get 2 percent cash incentive. The government put in serious diplomatic efforts that resulted into the duty free access of garment products to some countries aiming to give the garment sector a further boost. The Japanese government relaxed the Rules of Origin (RoO) from April 1, 2011, which boosted exports to the country. The country’s garment exports to Japan are on the rise on the back of favourable trade policy and higher demand. Similarly, India extended zero-duty benefit to all products except 25 alcoholic and drug items from November 2011. In 2011, the China government also gave duty benefits to Bangladesh on export of 4,721 products which include garment items., The Chilean government announced duty-free benefits for all Bangladeshi products while South Korea has also given duty-benefits to some Bangladeshi garment items. On the other hand, the government initiated an innovative incentive package in 2008 to offset the impact of the global financial crisis on the sector. Exports to India, China, Russia, Japan, South Africa, Turkey, Brazil, Chile, Mexico, South Korea, Malaysia, Australia and New Zealand, took off. In 2008, garment exports to destinations other than the US, EU and Canada stood at $800 million; in 2013 the figure crossed $3.5 billion. Apparel makers got 5 percent cash benefits against their export proceeds if sent through an electronic system known as telegraphic transfer (TT)—a move that aims to help them recoup the losses caused by political unrest. The products that will enjoy the incentive from the government are woven, knitwear and terri-towels. Separately, the government cut export tax by a half and increase cash incentive by one percentage point for garment exporters, which will cost the government around Tk 3,000 crore. In the fiscal year 2013-14, the government oversaw four state owned banks sanctioning loans worth TK 112.75 billion for the promotion of this sector while two specilazed banks provided financial assistance worth TK 13.4 billion. 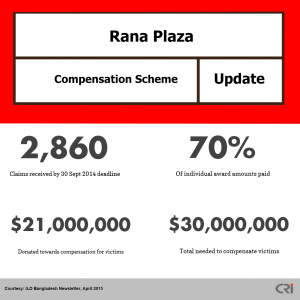 Low wage of the garment workers was a burning issue in Bangladesh as the workers and employees couldn’t come to an agreement despite several rounds of talks over the years. To avoid conflicts and stalemate situations, Prime Minister Sheikh Hasina came forward and raised the minimum wage of workers by 77% from 1600 tk (20 $) to 5300 tk (66 $). The cabinet committee for RMG sector so far formed one task force on “Building Fire Safety in RMG sector” headed by one joint secretary of Ministry of Labor and Employment. The fire service department has been providing training for mid level factory supervisors. The cabinet committee for RMG sector so far formed one task force on “Building Fire Safety in RMG sector” headed by one joint secretary of Ministry of Labor and Employment. Government is collaborating with ILO to formulate an inspection policy for the factories and establishments. This policy is designed to ensure effective and prevention-oriented labour inspection and occupational safety. The responsible ministry has recruited 67 inspectors so far. Representatives of BKMEA, BGMEA and MOLE have inspected some 1720 export oriented RMG factories. In accordance with the recommendation of the team, a total of 17 factories have been shut down. In June, 2014, 14 factories have been surveyed, 218 concerned officials have been trained. An additional secretary level officer has been appointed as Inspector General of the department. Additionally, a proposal for increasing the number of inspectors from 50 to 310 at the Directorate of Fire Service and Civil Defence has been sent to the Ministry of Home Affairs. Bangladesh, the EU and the ILO have adopted ‘Sustainability Compact’ (endorsed by USA too) with a view to taking joint initiatives to improve labour welfare and safety . In order to make the law time-befitting, a total of 87 sections of the 2006 Labour Act have been amended. Till June 2014, a total of 203 trade unions have been registered since the move initiated in January 2013. On March 30, 2014, a worker data base has been created. Government’s Establishment of Labor Management committee on occupational safety and health and fire safety has been included in the Bangladesh Labour amendment act 2013. To formulate necessary rules of the act, a committee headed by the MoLE has been formed. The first meeting of the committee was held on January 22, 2014. To ensure the occupational health and safety for every factory worker in Bangladesh, the current government has finalized a draft of a policy on this issue. Bangladesh government is considering providing cheap housing and/or accommodation facilities for RMG workers. The Department of Women Affairs under Ministry of Women and Children Affairs has acquired 0.97 acres of land in the outskirts of Dhaka to build a hostel for female RMG workers. This project will be started from 2017. By the same token, the government is collaborating with the Chittagong Development Authority (CDA) to provide lodging facilities to 1000 female RMG workers along with a market, a hospital, open grounds and gardens. 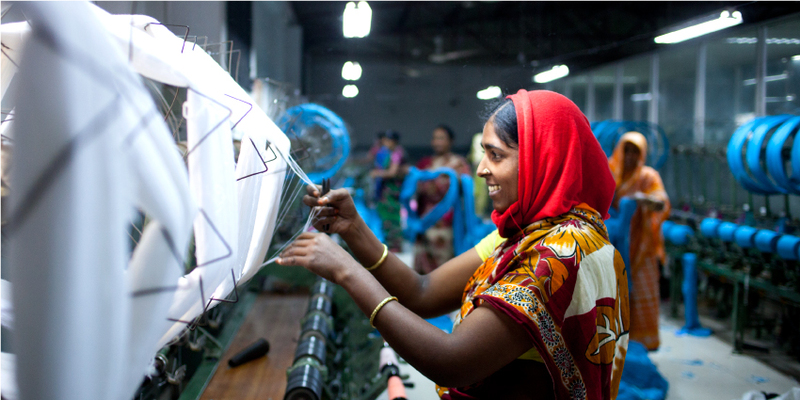 Fuelled by a booming turnaround in the last fiscal year, Bangladesh’s apparel sector is now set to take the next giant leap. And first ever in its history, the county exporters hosted an apparel summit where they hoped to hit $50 billion garment exports by 2021. The three-day Dhaka Apparel Summit has brought together retailers, trade body leaders, policymakers and scholars, especially from the US and the EU, the two main export destinations of Bangladeshi garments. The government has pledged to set 18 more economic zones in different parts of the country.